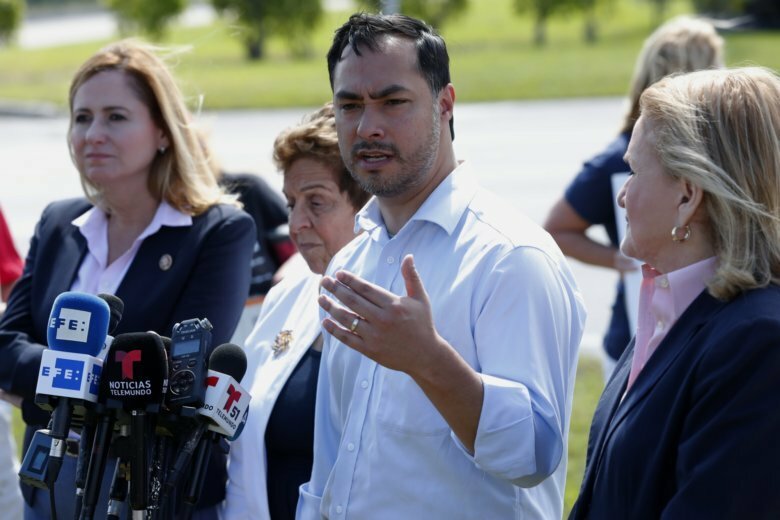 HOMESTEAD, Fla. (AP) — Congressional Democrats from Florida and Texas on Tuesday toured a migrant camp, where they said children are being held for too long in a place that has a “prison-like” feeling. The lawmakers held a news conference after visiting a facility in Homestead, Florida. They pledged to work for children who cross the U.S.-Mexico border to reunite with their families already in the U.S. The Democrats say those who cross with siblings, aunts or uncles should remain together. Rep. Debbie Mucarsel-Powell says she met a girl who was separated from her aunt and had been at the center for nine months. Texas Rep. Joaquin Castro, the chairman of the Hispanic caucus, was part of the delegation. “What we saw today as we visited the facility was very troubling. It had a prison-like feeling,” said Mucarsel-Powell, whose district includes Homestead, a Miami suburb. Mucarsel-Powell said she does not want teenagers “aging out” at the facilities and handed over to immigration agents when they turn 18. Also, lawmakers said labeling the migrant children as “unaccompanied” like the government does is misleading because some children are arriving with relatives who are not their parents. Federal requirements implemented last year mandated more stringent background checks on their families, which slowed the children’s release to family members. The average length of stay at Homestead went up from 25 days last June to 67 days last December. The government has said the facility can expand to house up to 2,350 children. Plans for Homestead’s expansion were announced at the same time authorities announced the closure of a controversial detention camp in Tornillo, Texas, which shut down in January after months of protests by immigrant advocates and politicians. The Homestead camp is now the only temporary facility in use. The U.S. Department of Health and Human Services offered a press tour last week, showing a large room where 144 teenagers slept in bunks, and portable toilets were housed in adjacent tents. The children walked in groups of 10 to 15 in single file, usually led by a uniformed employee. The employees do not undergo state screenings for child abuse and neglect, and the facility can operate unlicensed because it is located on federal property — a former Labor Department Job Corps site. The company that runs the center is Comprehensive Health Services, which is part of Virginia-based Caliburn. Officials say it costs the government $750 per child per day at a temporary facility.